Very low manufacturing costs – While near-zero carbon emissions while riding is an accepted norm, not everyone talks about the fact that production of bike needs a mere fraction of materials and energy as compared to building a car and hence adds to reduced carbon footprints. Great alternative for a second car – Instead of buying a second car, it makes sense both financially and from a health perspective to buy a bicycle. 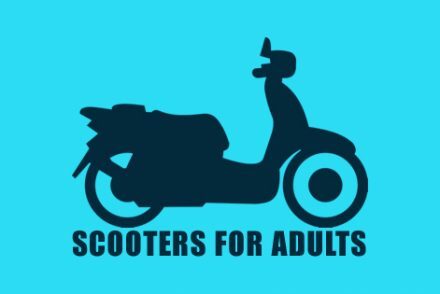 A lot of money can be saved by using this “second vehicle” during weekends, partly commuting to work, to run errands within your locality and more. Health benefits – Cycling is a fun way to exercise and keep fit and improve your general health. Savings in parking space – You can park multiple cycles in place of one car thereby saving space and cost of building a large parking lot. Of course, this advantage is more for the community than for the individual. No need for gasoline – and hence the cheapest mode of transport second perhaps only to walking. 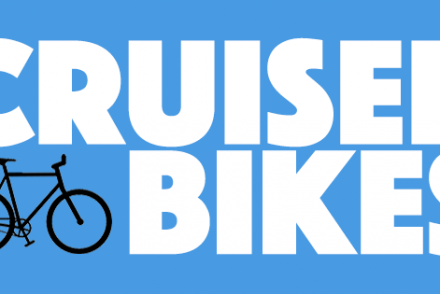 Sometimes can be a more efficient and faster mode of transport than a car – Considering the choking traffic jams that you are faced with on many days, it might be more prudent to take out your bicycle instead of your car in some instances. More such valid reasons abound even if the above-mentioned ones are insufficient for you. 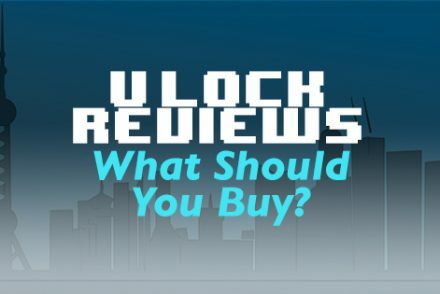 However, like most consumers, I am sure you are looking for bicycles that promise you value for your money. The Merax Finiss Mountain Bike is constructed with heat treated 6061 aluminum frame and features lightweight magnesium alloy wheels making it very buoyant and easy to ride. The mechanical lock out suspension fork featured in the bike is made with advanced aluminum and is designed specifically to overcome challenges of riding on mountainous terrain. 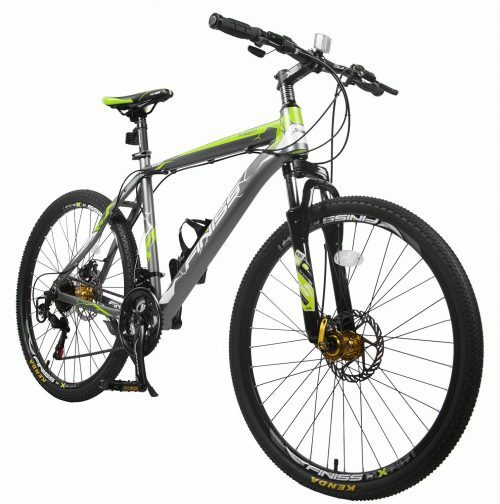 The Merax Finiss mountain bike comes with proven Shimano 21-speed shifters and derailleurs. These components ensure smooth shifting thereby enhancing your riding experience. The rear and front mechanical disc brake system provide for faultless stopping maneuvers. This easy-to-assemble value-for-money bicycle promises to offer a wonderful and durable riding experience. 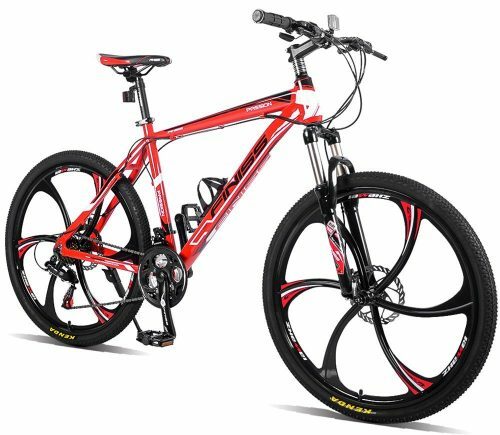 Made with heated aluminum for enhanced light-weightedness, the Disc Brake-powered Merax Finiss Mountain Bike features double wall rims for smoother rolling. Reliable shifting is ensured through Shimano 21-speed shifters and derailleurs. The bike features rear and front disc brakes giving you the confidence of a smooth and perfect stop. The 80mm suspension fork provides for unhindered riding over bumpy and rough surfaces through enhanced control. 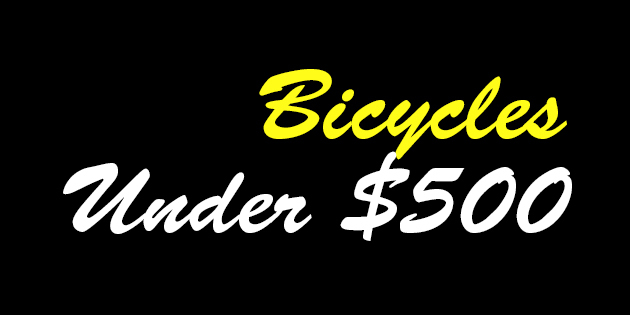 Fitted with high-quality hardware for durability, this is a great bike at an unbeatably low price. 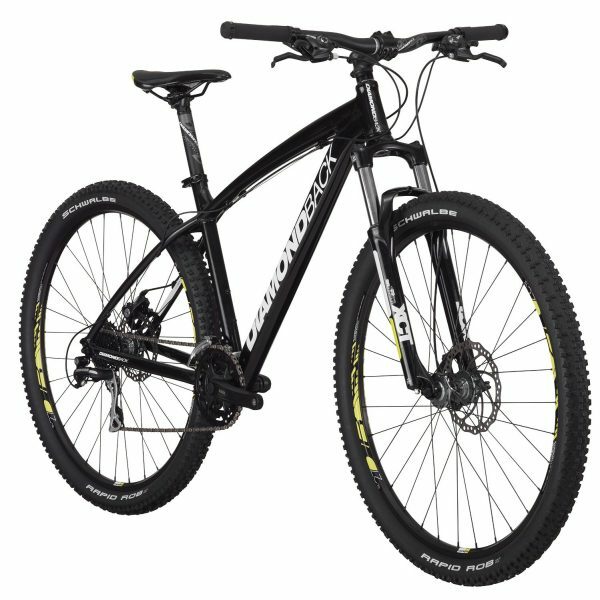 Available in four different sizes including small, medium, large, and extra-large, Diamondback Sorrento Hardtail mountain bikes’ frames are constructed with heat-treated 6016 T6 aluminum alloy for increased durability and toughness. The 27.5-inch wheels deliver smoother rolling with improved traction. The bike features Shimano 3-speed front derailleur and 7-speed rear derailleur giving you 21 gear options to choose from making it highly suitable for all kinds of surfaces and terrains. You will achieve confident and simple stopping via the linear pull brakes. The proven Shimano shifters promise you a smooth shifting operation. Fitted with 26-inch wheels, this bike employs Schwinn aluminum dual suspension frame with steel rear providing for robustness and buoyancy. It comes with Shimano Altus 24-speed shifters integrated with Shimano EF-50 Triggers offering reliable shifting and a smooth ride across all terrains and inclines. The bike comes with Suntour Suspension Fork and Pro Max front disc brake for confident stopping. 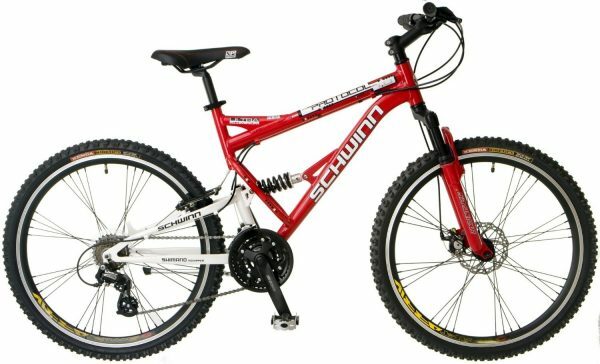 The MTB handlebar features Schwinn 4-bolt A-Head stem for a comfortable riding position. The 26-inch wheels feature high-profile alloy rims and black bladed spokes giving a contemporary and sporty profile to the bike. This tried and tested bike’s hand built hardtail frame is made with 6061 T6 aluminum for improved agility and sturdiness. The SR Suntour suspension fork allows for enhanced control and riding comfort. 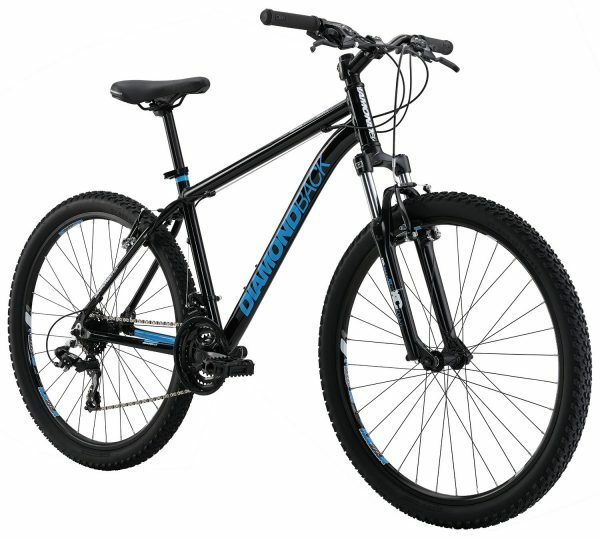 It is fitted with Shimano 8-speed shifters for smooth and reliable shifting operation. The Tektro mechanical disc brakes deliver amazing stopping power. The “Ready Ride” epithet means this bike is easy to assemble and is ready to ride almost as soon as it is unpacked from the box. Bikes are great mobility solutions for people who either are unqualified for driving or cannot afford to buy and maintain a car. Moreover, there are studies which show that people commuting by bikes are more productive, healthier, and take less time off from work for reasons of illnesses. That is why many employers are encouraging cycling to work and are accommodating cyclists more than ever now. Cycling is a wonderful stress-buster, highly therapeutic for the body and mind, and is fun too. So which of the above choices were syncretic with yours? Do write in and let me know.